Ready for a bit of physical activity, we were excited to walk a moderate trek called C38 through the surrounding volcanic rock outcroppings that dominate the natural environment of the city. 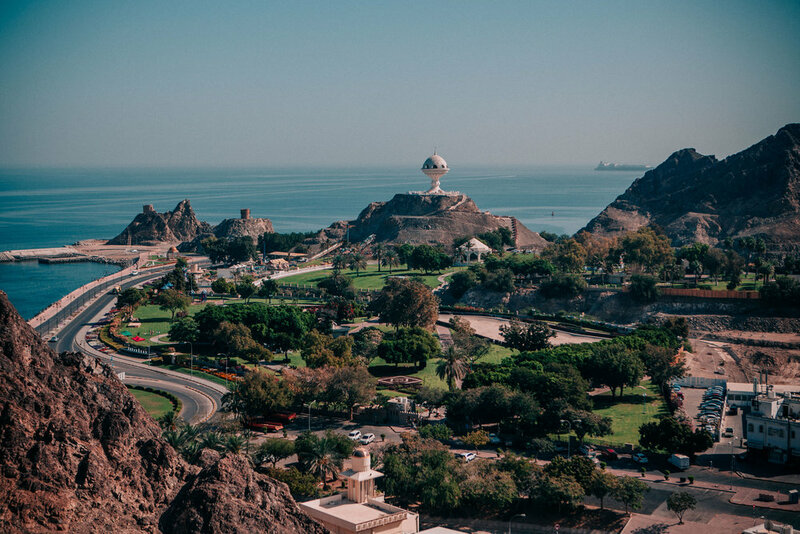 The route, running from Riyam Park to the Mutrah area, includes some amazing views of the Riyam Park Monument, the modest ruins of a defunct village, and a walk through a Wadi bed. We emerged in Mutrah, an older area of the city that provides a pleasant view into everyday life in Muscat. We enjoyed this street scene near the Mutrah Souk (a famous traditional market in Muscat). Cruise ships now dock nearby the market so it is getting more touristy; but one can still find interesting trinkets, gifts and dirt cheap delicious sambusas to snack on in its labyrinthine confines.